Acknowledged author Robert Walker wrote Personal Finance comprising 496 pages back in 2016. Textbook and etextbook are published under ISBN 0077861728 and 9780077861728. Since then Personal Finance textbook received total rating of 3.5 stars and was available to sell back to BooksRun online for the top buyback price of $59.81 or rent at the marketplace. 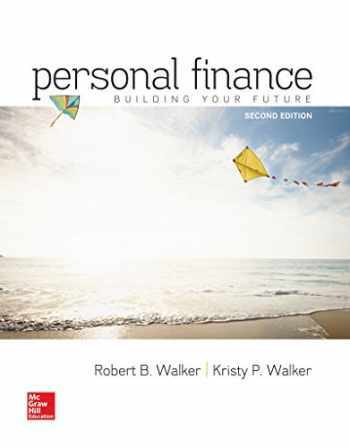 Personal Finance, 2e by Walker/Walker offers students an engaging treatment of personal finance, while incorporating unique themes, an application-driven pedagogy, and a definitive action plan. Unlike other texts on the market, it offers a frank and timely discussion of living within one’s means and incorporating personal values and priorities into a personal financial plan. The intent is to help readers set priorities that guide their finances, rather than the other way around. This book establishes a path toward financial freedom that is less about accumulating wealth and more about building a future tailored to individual goals. With Walker/Walker, your future looks bright!